Name that alpaca -- after a violinist! "My wife and I raise alpacas, and every year we named them after artists. This year we've decided that we would like to use violinists. Our first cria (baby) is a female, so we would like to see a comprehensive list of female violinists. Where can we go to see such a list? 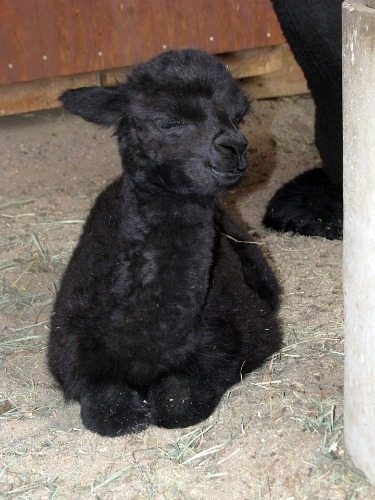 Thank you, Tom & Tsulan Balka, Lavender Fields Alpacas, Elizabeth, CO"
Awwww! Shall we help them out? I'm all for anything that promotes violinists, and the art of violin! Any other suggestions for Tom and Tsulan? Haha, awesome. I'm hoping to eventually get my list up on my website...when I do, I'll have a list of about 200 female violinists born pre-1920...that's a lot of alpacas. As for names, I like Stefi (Geyer) and Teresina (Tua)! I think both Midori (Goto) and Akiko (Suwanai) have to be on this list for the first alpaca! Naoko, Sayaka, Akiko (Terai, Shoji, Suwanai) — as you can see, I have a great affection for Japanese violinists. ;-) Also, Isabelle and Wanda (Faust and Wilkomirska), the last one due to my heritage. Ginette Neveu!! Ida Haendel is also a great historic (and still alive) violinist, but I prefer French names. I'm pretty sure Neveu is pronounced Ne-voo as my teacher is French and that's how he says it. It just rolls off the tongue! She looks like a Hilary to me. For example, Leila (Josefowitz, I love her name!). P.S. The cria's mom, or "dam," is "Emily Bronte"! Hilary Hahn, though I like to think Hilary's prettier than an alpaca! For a female alpaca, the name Hilary Hahn gets my vote! Some more historical male violinists: Eugene Ysaye, Fritz Kreisler, Nathan Milstein, David Oistrakh, Christian Ferras, Mischa Elman, Zino Francescatti, Leonid Kogan...if you wanted to include composers who were also violinists, that opens a whole other field. Felix Mendelssohn, Johann Sebastian Bach, and Wolfgang Amadaus Mozart, to name a few.